The field of landscape architecture is expected to continue to grow over the next several years. According the statistics reported by the United States Department of Labor, the employment rate for landscape architects is projected to increase by 5% between now and 2024. Populations around the globe are expanding, and these growing populations are creating a need for development while the strain of development on the natural environment and resources is creating a need for trained individuals capable of balancing both facets without causing detriment to one or the other. Landscape architects are included among the professionals responsible for managing the two. The landscape architect works in collaboration with other professionals to create functional designs. However, while other professionals are concerned with the practicality of the project, it is the responsibility of the landscape architect to create a beautiful project design, like some of these top beautiful schools, while ensuring the continued sustainability of the natural resources and ecology of the area being developed. Landscape architecture has become one of the premier occupations of today; ranking among the best professions to enter. Providing the opportunity to contribute to the protection of the environment and natural resources while performing an essential service, the field is both challenging and fulfilling. The profession requires individuals with skills in creativity, science, problem solving, collaboration and an aptitude for technology. Individuals entering the profession will require knowledge and training in a vast array of disciplines and subject areas. Practical experience is essential to developing an inherent understanding of the various aspects of the field. The landscape architecture profession is competitive, with most employers and clients seeking individuals with industry experience, even for entry level positions. It is exceedingly important to obtain an education in landscape architecture from a college or university with a comprehensive degree program which incorporates experiential training with academic studies. Selecting an institution with accreditation through the Landscape Architecture Accreditation Board will ensure the quality of the program. What Are The Best Landscape Architecture Programs? The Department of Landscape Architecture at the University of Florida offers the only professionally accredited bachelor of landscape architecture program in Florida and is considered to be one of the best landscape architecture schools in the United States. The department was established in 1933, and its mission is to conduct research to enhance the understanding and practice of the profession of landscape architecture, and address societal challenges. Their faculty research interests are diverse and cover a wide spectrum of practice and theory. Students in the programs are provided opportunities to study in summer programs abroad in places like Nantucket, Mexico, Prague, and China. There are also longer study abroad programs that take place over the course of an entire semester. The degree programs are fully accredited by the Landscape Architecture Accreditation Board. The University of Florida offers a five-year bachelor of landscape architecture program that combines classroom instruction and studio work. Fifth-year students are required to complete an independent capstone project that will showcase the culmination of their academic work. Internships are also encouraged after students’ third year of study. At the graduate level, the university offers a first professional master of landscape architecture program, a post-professional master of landscape architecture program, and a interdisciplinary program leading to the doctor of philosophy degree in design, construction, and planning. Master’s students may either produce a thesis or a terminal project, which allows for greater flexibility in formatting. The Landscape Architecture & Regional Planning program at the University of Massachusetts Amherst was first founded in 1903 by Frank A. Waugh as an undergraduate program in landscape gardening. The department has evolved and now offers several distinct programs. The department is excited about continuing changes and recently moved into a brand-new sustainable building in January 2017. The department has six different areas of specific research and teaching, including community engagement, technological innovation and regional economy, culture, heritage and society, design exploration, regenerative urbanism, and regional and greenway planning. These areas make up different graduate certificates. All of the degree programs are professionally accredited. The Landscape Architecture & Regional Planning department has a number of degree options compared to other landscape architecture schools, including two different bachelor of science degrees and a two-year associate degree. On the graduate level, there is a master of landscape architecture program, a master of regional planning program, and a Ph.D. in regional planning. Dual degrees and various certificate programs are offered, and students have several options to study abroad. The Department of Landscape Architecture at North Carolina State University at Raleigh is a part of the university’s College of Design. The department’s mission is to teach, learn, research, and apply state-of-the-art practices that create innovative and resilient landscape solutions focused on human and ecosystem health, social equity, and the quality of life. The landscape architecture programs focus on strategic design thinking and encourage students engage with the discipline as it evolves with ever-changing environments. Students have access to more local "laboratories" of the Mountain, Piedmont, and Coastal Plains regions of North Carolina, and are also encouraged to pursue their studies abroad in Prague, Czech Republic. The landscape architecture programs are fully accredited by the Landscape Architecture Accreditation Board. North Carolina State University at Raleigh no longer offers a bachelor of landscape architecture program, but it continues to offer its graduate programs, including the first professional master’s of landscape architecture, the post-professional 48-credit-hour master’s of landscape architecture, and the post-professional 30-credit-hour master’s of landscape architecture degree programs. The first half of all degree programs will provide core knowledge and tools, and the second half will allow students to engage in the profession and discipline through individual research and study. The College of Agriculture and Life Sciences at Cornell University is regarded as one of the best landscape architecture schools and an international leader in education and research. The pioneering research performed at Cornell University has resulted in substantial contributions in the advancement of knowledge regarding plant and animal health. The Department of Landscape Architecture, established in 1904, endeavors to produce socially responsible and creative graduates. The flexible curriculum permits students to tailor the program to their individual interests. Students are encouraged to explore innovative and functional solutions for the challenging problems associated with the profession. Emphasis is placed on the importance of conservation. The courses are taught by world-renowned experts and educators. Students are afforded the benefit of the extensive resources associated with the college and the cutting-edge facilities, which include state-of-the-art technology and tools. The Department of Landscape Architecture offers both undergraduate and graduate degree programs in the field. Students enrolled in the undergraduate program complete coursework in both theory and practice. Required courses include integrating theory and practice, medium of the landscape, grounding in landscape architecture, photography and the American landscape, site construction, site engineering, urban design, and computer applications in landscape architecture. Undergraduate students have the opportunity to participate in research or teaching for academic credits, complete studio courses, and attend field trips. General core curriculum includes courses in written and oral expression, social sciences, humanities, physical sciences, or biological sciences. Concentration areas are developed by students and include fine arts, design studios, urban remediation, green architecture, landscape art, landscape history, landscape preservation, and historic preservation. The Department of Landscape Architecture at Clemson University, established in 1987, is a part of the university’s College of Architecture Arts and Humanities, whose mission focuses on transformative education, knowledge development, and creative expression in rapidly changing environments locally and around the world. The department values the art and science of design, engagement, innovation, ethical environmental and social justice, responsible land stewardship, the power of place, and international education. Students in the department are encouraged to pursue interdisciplinary studies in subjects such as forestry, sociology, historic preservation, engineering, and tourism, to name a few. Students are provided the option of pursuing their studies off-campus in Charleston, South Carolina, Genoa, Italy, and Barcelona, Spain. All three degree programs are accredited by the Landscape Architectural Accreditation Board. Clemson University offers both a bachelor of landscape architecture (BLA) and a master of landscape architecture (MLA). The MLA includes a first professional degree for students pursing an MLA degree with no design background and a second professional degree for students seeking an advanced degree in landscape architecture. Students working toward the BLA will be required to present a landscape architecture portfolio that will display the culmination of their work over the course of the five-year program. An exit project will include a design-build project or a substantive research project. The exit studio synthesizes and builds on skills developed throughout the program. The first professional MLA program is a three-year program designed to give students a professional education but is also an opportunity for extensive research or project work. Students may be admitted to this program with a bachelor’s degree in any discipline from an accredited university. The second professional MLA requires that incoming students have a five-year bachelor of landscape architecture degree. The Department of Landscape Architecture & Environmental Planning at the University of California-Berkeley was founded in 1913 and focuses on the design, management, renewal, and restoration of diverse landscapes. The department values field study as much as classroom instruction and encourages their students to immerse themselves into the community landscapes with the help of their multidisciplinary faculty. The department’s research interests range from the design of innovative public spaces, including small-scale green spaces, streetscapes, public plazas and parks, to planning for ecological infrastructure, resource-efficient community design, urban forestry and environmental restoration, and landscape ecology. Program field studies have included projects throughout California and the United States, as well as Mexico, Egypt, France, Portugal, Thailand, Japan, Korea, Ecuador, and China. The Department of Landscape Architecture & Environmental Planning offers a four-year bachelor of arts degree in landscape architecture, a two- or three-year master of landscape architecture degree program, with the option to specialize in environmental planning, and a PhD in landscape architecture and environmental planning. The undergraduate program offers a liberal arts perspective and also provides the necessary training for those interested in pre-professional education. The BA requires both a physical and biological science course as part of its core curriculum before students may sign up for major courses. For the MLA, students must select to pursue one of two degree paths, either Plan I – Thesis or Plan II – Comprehensive Exam (professional project or designated studio). The thesis requires students to do original research on a problem in landscape architecture or environmental planning. The comprehensive exam format can either be a professional project or a designated studio that demonstrates broad competence plus the concepts and skill necessary to the field of landscape architecture. Students are also strongly recommended to complete an internship, but professional experience may substitute. The College of Environmental Design also offers introductory summer programs for students interested in exploring different areas of environmental design. The Department of Landscape Architecture at the University of Wisconsin-Madison is a part of the university’s College of Agricultural & Life Sciences. As with most land grant universities in the United States, instruction in landscape architecture began in the College of Agriculture in 1888. In 1926, landscape architecture became an official undergraduate degree program. The implementation of a master’s degree was not far behind and was established in 1929. The Department of Landscape Architecture’s mission is to provide a learning environment in which faculty, staff, and students can advance the discipline and profession of landscape architecture through creative discovery, critical examination, and transmission of knowledge. Like many landscape architecture programs, the University of Wisconsin’s approach is interdisciplinary, aiming to make students more aware and sensitive to the world we live in and provide specific training for complex problem solving. The Department of Landscape Architecture offers two different undergraduate degree programs, the bachelor of science in landscape architecture (BSLA) degree program and the bachelor of science degree program (ALS)(Landscape Studies). The BSLA is a professional degree program that is accredited by the American Society of Landscape Architects and will train and equip students to become licensed landscape architects. Both programs will prepare students for graduate work. The university also offers a master of science degree in landscape architecture, which is different from most MLA degrees offered by other programs. Students also have the option of pursuing a specialty program in either community and urban landscape studies or restoration ecology and ecological design. All programs will provide students opportunities to work in the University of Wisconsin’s 1,200-acre arboretum, the purpose of which is to provide examples of Wisconsin’s native plant communities. Since its modest origins in 1884, the Department of Horticulture and Landscape Architecture at Purdue University has earned national regard for their high-quality degree programs and is consistently acknowledged as one of the top landscape architecture schools. Purdue University endeavors to provide students with the skills and knowledge necessary to become responsible professionals capable of developing innovative and aesthetically appealing solutions to the challenges of the landscape architect profession. Students who choose to pursue a degree in landscape architecture at Purdue University will have the opportunity to study abroad, participate in groundbreaking research and outreach projects and the highly regarded and unparalleled cooperative education program. Graduates of the programs at Purdue University have become internationally renowned educators and researchers in their fields employed by governments, corporations and organizations around the world. Purdue University offers undergraduate and graduate degree programs in landscape architecture. The five-year undergraduate professional landscape architecture degree program equips students with the analytical, technical, and creative design skills necessary to create environmentally harmonious landscapes that are both beautiful and functional. The curriculum is tailored to develop students’ skills in planning and communications and knowledge of environmental sciences, regulations and drafting. Students enrolled in the program are required to complete four years of academic study and one year of cooperative work experience. Courses include survey of landscape architecture, graphic communications for students of landscape architecture and design, statistics, woody landscape plants, planting design, site systems, computer technology in design, history and theory of landscape architecture, and a range of design, communication, and science electives. The University of Illinois at Urbana-Champaign was one of the first institutions in the United States to offer a landscape architecture program, with an official degree program in 1907. The university strives to focus on the impact of human activity on the environment, as well as the influence of natural and historic factors on settlements, behavior, and well-being. The department believes that landscape design is inherently an interdisciplinary field, and it strives to seek out experts in a variety of applicable disciplines in order to enhance the program’s diversity. The department of landscape and design is a part of the College of Fine and Applied Arts at the university and encourages collaboration with fields like architecture, urban planning, engineering, geography, new media, and history. The degree programs in the department are accredited by the Landscape Architecture Accreditation Board (LAAB). The Department of Landscape Architecture at the University of Illinois offers undergraduate and master’s level programs, as well as a PhD program in landscape architecture, one of the few in the nation. The bachelor’s degree in landscape architecture (BLA) is a four-year program consisting of 124 semester hours. Of those, 65 hours are required to be landscape architecture courses, consisting of design studio, construction, plant materials and design, history, design communication, and a professional internship. Since the program is a part of the College of Fine and Applied Arts, there is a foreign language requirement, as well as an art and rhetoric requirement. The master’s in landscape architecture is structured as either a two-year or three-year program, depending on whether or not a student chooses to study design as well. Studies will consist of a combination of studios, coursework, and thesis research/development depending on approval. Students also have the option of pursuing joint MLA/master of urban planning or MLA/MBA programs. All students are required to complete a professional summer internship, and design students will spend their final fall semester at the Chicago Studio to further study urban landscapes. The University of Connecticut’s Plant Science and Landscape Architecture program focuses on a combination of research and real-world experience to equip students for careers in landscape architecture. The department encourages community outreach and hosts public programs and events like Master Gardeners, Invasive Species, and Integrated Pest Management. Program directors and students utilize their expertise to provide applicable tools directly to the community. About 150 years ago, Connecticut’s Frederick Law Olmsted inspired the conservation of Yosemite Valley, designed Central Park, solved the flooding of Boston’s Back Bay Fens, and he designed college campuses across the country. His work was the launching ground for landscape architecture, and it continues to inspire the department of landscape architecture at the University of Connecticut. The University of Connecticut offers a bachelor of science in landscape architecture, as well as a master’s and doctoral degrees. Since the department focuses on both landscape architecture and plant sciences, there is quite a bit of overlap, especially on the outreach front. They care about solving planning problems in communities as well protecting and restoring natural resources. All undergraduate students are required to complete an intro-level biology class, as well as chemistry, before beginning landscape theory and graphics classes. In their senior year, students will be required to complete and present a capstone project that showcases their undergraduate work. Students who plan to continue their studies at the graduate level should expect to focus heavily on individual research with a faculty member. There are two master’s degree options. Plan A has a research component, and students are eligible for graduate assistantship. Plan B will consist of more coursework beyond Plan A with a lesser emphasis on research. Most universities do not currently offer an accredited landscape architecture degree online, since much of the learning is research-based and requires hands-on fieldwork. Several schools may offer individual courses online that may suit students’ individual needs, but as of now programs cannot be completed fully by distance learning. For students looking for a more flexible learning environment, consider individual departments to explore options and looking for low-residency programs. 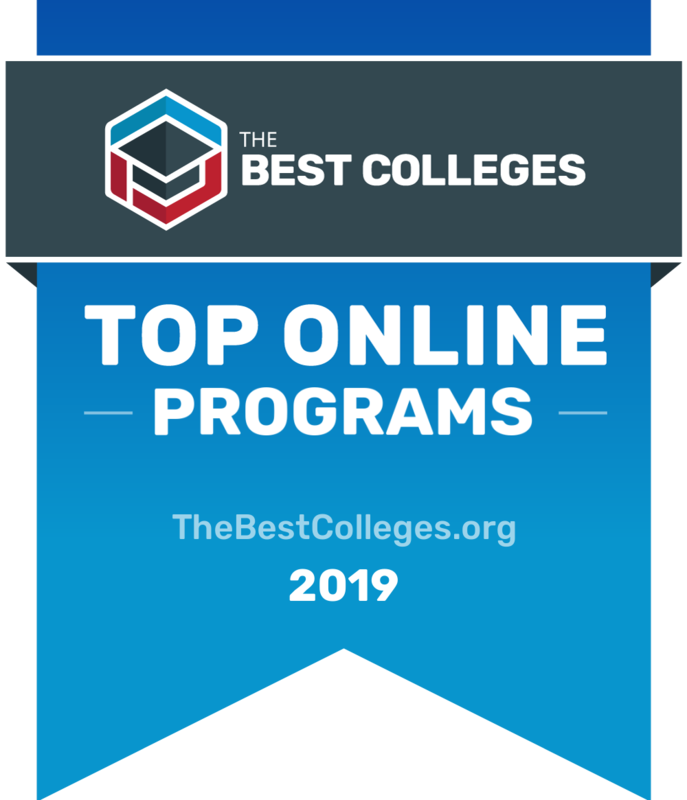 To determine the best online landscape architecture programs, we looked at the most important factors prospective students, mainly common predictors of future success and a school's commitment to online programs. This boils down to admissions rate, student loan default rate, retention rate, graduation rate, and the percent of students enrolled in online classes. All data points are taken from information provided by colleges and universities to the National Center for Education Statistics. Each factor is weighted evenly in order to give an objective view and determine the 10 best online landscape architecture programs. To calculate our rankings, we looked at a school's ranking when organized by a single factor, and then averaged each category's ranking to find an overall score: Admissions Rate (20%) + Default Rate (20%) + Retention Rate (20%) + Graduation Rate (20%) + Percent of Students Enrolled in Online Classes (20%) = Final score.